From the "Lincoln County Times," Davenport, WA. ..."People already here were confident and cheerful, however, for the location was such that it was only a question of time until railroad communication would be established, and then a bright future was assured. A year ago last summer the construction of the Seattle, Lake Shore & Eastern road was commenced by a company of capitalists. It was headed westward through a rich farming country. The jealous eyes of the Northern Pacific officials saw that the trade of a vast inland empire was about to be wrested from them by a competitor. A branch of the great transcontinental line must be thrown out to counteract the effect of the building of the other road. To think was to act. Ground was at once broken on the Central Washington, and rapidly two ribbons of steel stretched off into a section that had never echoed to the shriek of the iron monster. The people of Davenport watched anxiously the movements of the rival companies. A year ago this month the sound of the approaching locomotive could be distinctly heard far off to the southeast. In February the Central Washington crew spiked the iron into the corporate limits and connection with the outside world was complete. The advent of this railroad was the cause of much rejoicing and a new impetus was given to the place. By a great mistake the Seattle, Lake Shore & Eastern was built to withing four miles of town, and there the terminus remained for some months. At last the enterprising citizens raised the necessary amount to grade the roadway into town and then Davenport had the advantage of a competing line with all points east and west, at the same time insuring for its being a railroad center, as no road will be constructed across the state in future years without being compelled to pass through this place." "On every side one sees new buildings under course of construction and the sound of the carpenter's hammer extends far into the night. The new depot is among the principal buildings now in process of erection and around it centers most of the interest of our citizens. Freight from the terminus of the new railroad, but a short distance away, is landed in town daily. Strangers seeking locations in all branches of business select this town as headquarters and all acknowledge that few places in eastern Washington offer the inducements of the Big Bend. The elevator is daily storing large consignments of grain, preparatory to shipping to other points, and freighters' teams make this city their destination instead of surrounding towns. The 'boom' has struck Davenport and will stop with us for some time." This article was written regarding the approach of the SLS&E to its temporary terminus within a little less than five miles of town in December, 1888. This appeared to be a signal for something approaching the nature of boom times. The close of the year 1898 marked the removal from Lincoln county of an old landmark--nothing less than a railroad. The Seattle, Lake Shore & Eastern Railway, which had created so much enthusiasm among the citizens of the county at the time of its construction, but which was operated only a short time, was of no use to the company which owned it and the rails were taken up and utilized in the extension of branches in Idaho. The destroying hand of time has since erased the embankments, and a few cuts through the barren "scab land" are all that is left to indicate that a railroad ever passed that way. From "The History of The Big Bend Country." "The Seattle, Lake Shore & Eastern Railroad, a branch of which was extended from Spokane to Davenport during the winter of 1889, and for which the property holders of the town put up liberally for the purpose of inducing the management to run through, instead of around the place, has just been transferred to the committee of the mortgage bond holders and the deed placed on file in Spokane. "This deed conveys the road, commencing in the city of Seattle and running to Sallal Prairie, 62 miles; a line commencing in Woodinville, King county, running to Sumas, 101 miles; a branch known as the Hilron branch, and 18 miles of additional branches and spurs; also the main line in the eastern division, commencing at Spokane and running west to Davenport. The transfer includes all the rights of way, franchise, rolling stock, buildings, etc., and 2,500 shares of stock in the Union Depot Company, at Spokane, and its leasehold estate for 99 years in the depot grounds; also the railroad company's title to tide and shore lands in King County. "The company was enjoying an era of unequaled prosperity at the time this road was built through Lincoln county, an the people and the railroads all seemed to have plenty of money. Roads were being built everywhere, and scarcely a week passed that a party of surveyors did not pass through looking up a route for some projected line. It was not hard for them to raise the necessary money to induce the Seattle road to build in, which was believed to be a necessary thing in order to build up the place so that other roads could be controlled that talked of penetrating the Big Bend. These were thrifty days when people heard little and cared less about free silver and sub-treasury schemes. All went along smoothly enough for two or three years and then a reaction set in. Railroads quit building, money began to get scarce; all sorts of political nostrums were advocated; taking short cuts to ease and fortune, and then the business failures began. No more was heard of projected railroads, and the Seattle, Lake Shore & Eastern line, after a hard struggle, finally ceased to be operated altogether between Davenport and Spokane, and now reverts to the bond holders. Railroads, as well as individuals, overestimated themselves, strained their credit and now a good many of them have valuable experience but a good deal less money." Port of Royal Slope commissioners voted to abandon rail service during a meeting in mid April. This will halt operations on the former Milwaukee Road line between Othello and Royal City, WA. Volunteers from the Yakima Valley Rail and Steam Museum had operated the line. Tuesday, August 13th, 1895, there occurred a bad wreck on the Central Washington railroad just east of Almira, which resulted in the death of Fireman Prytz and serious injury to Engineer Hobart. The train consisted of fourteen cars of cattle belonging to W.H. Fleet, of Coulee City, en route to Chicago, and one car of horses owned by Griffith Jones, consigned to Wisconsin. The train was coming down grade at a rapid rate, and when the curve was reached, near Almira, the engine and the entire train with the exception of the horse car, a cattle car and the caboose, went over the ditch twenty feet below, piling one car of live stock upon another making a frightful wreck. Of the 314 cattle 150 were either killed or maimed, making their destruction necessary. Fireman Prytz fell under the boiler and was killed almost instantly by scalding water. Conductor Roberts, Brakeman Downs, W. H. Fleet and three or four others were in the caboose and escaped injury. Great Northern Via Coulee City? The Great Northern Railway was built through Lincoln county in 1892. Preliminary surveys were made all over eastern Washington and many rumors were afloat as to the probable course through Lincoln county. For a period it appeared reasonable that some of the towns in the northern portion of the county would be on the line as it was thought that the crossing of Grand Coulee would be made at Coulee City. In fact the Great Northern Company filed their map in the Waterville land office showing this route. September 30, 1892, the Great Northern was completed to the Columbia river. Early History of Quincy Area? Ninety years or so ago there emerged in this great nation, the little town of Quincy, near the center of the state of Washington. Today’s bustling small city with its vegetable processing plants, controlled atmosphere storage and seed warehouses, has little resemblance to the windswept spot once designated by a sign post with the name Quincy. The Hartline Standard of September 19, 1903 reported: “Two years ago this coming October, Quincy was nothing but a sign board-a-name.” The sign was to indicate the siding where the booster engine could leave the trains after making the climb from the river, seven miles to the west. The name is said to have been chosen by a brakeman from Quincy, Illinois. Another story is told that the daughter of Jim Hill, owner of the Great Northern railroad had picked the name. The GN Co could shed no light on the subject. While the railroad had planned for shipping points to the west and the east, the siding called Quincy was for railroad use only. Each siding (a place for trains to pass) was identified by a name attached on a post for easier use by railroad workers. Columbia Siding, Vulcan, Trinidad, Crater, Quincy, Winchester, Naylor and Ephrata in the local area. It was back in 1870 that the federal government, wanting to increase their tax income by settlement of the west, contracted to have a railroad built. The Northern Pacific was to receive land along the route from Lake Superior to Puget Sound, every other section for twenty miles on either side of the line, in return for an operating railroad and telegraph line. Building of the railroad had been completed in the Quincy area in 1892. To bring the road from the north rim of the desert down to the river had taken nearly a year. To cross the river at Rock Island was also quite a problem. Late in 1892 a gale toppled the nearly finished bridge into the river with a loss to the contractor of $8,000. One month later a second bridge with the track laying machine went into the river along with seven men killed. During the early settlement of the state of Washington, the vast area now known as the Columbia Basin in the Big Bend country was considered an uninviting desert and not a livable land; just a vast cattle range overgrown with sagebrush. Even the Indians by-passed it for there was no water for man or animal. By the 1880’s a few stockmen had established headquarters bordering the area. They found that the bunch grass, which grew among the sagebrush of the desert, made excellent winter pasture for their cattle, sheep and horses. With snow on the ground the stock could go without water for some time. Cowboys and sheep-herders roasted jackrabbit over sagebrush fires. A 22 was a necessity to secure a meal or chase away marauding coyotes. Tom (Lord) Blythe of Rocky reach Ford on Crab Creek (of whom there are many colorful stories told) and Senator Helm of Ellensburg (who had a large camp on Lower Crab Creek) ran cattle and Hutchenson brothers had horses at the “Sinks” in between, where Crab Creek ran underground part of the way. Sam was 7’4” tall and his brother Ben 6’8”, a graduate of St Mary’s college in San Francisco. Their sister Bessie a mere 6’. Sam was thrown from a horse and killed in 1906. Other pastured large bands of sheep during parts of the winters. Also, hundreds of wild horses from the Horse Heaven country below Yakima migrated here, feeding on the lush bunch grass of the desert and traveling to Crab Creek of the Columbia River for water. After title was received by the N P, the state and county began assessing taxes on this land. Douglas County’s bill alone was around $25,000 a year. (Douglas county was split out of Spokane county in 1885 with only one person in the whole area.) It was in July of 1901 that the N P’s land agent, E F Benson appeared in Ritzville and began a push to sell the railroad land. He talked Ben E Hervey (formerly the manager of a harness and furniture store at Ritzville who had just celebrated his fiftieth birthday) into buying land in the desert. Mr. Hervey formed a partnership for the purpose of buying eighteen sections in the township around the Quincy siding at $3 per acre. James Hawks of Phoenix, New York put up half the money while W C Reeder of Spokane, O R Height of Ritzville, J M Woeher of Freaze, Idaho and Ben Hervey made up the other half. Mr. Hervey to receive $100 for every section he sold. Terms were one third cash and the balance in 1, 2 and 3 years at 6% interest. By 2-12-02 all 18 sections were resold at $7.50 and up per acre, over $70,000 return on their $11,500 investment in six months, and there were many more townships handled in this same manner. Township corners had been established every six miles which left settlers to figure out their own locations. Trails used by the early stockmen were the only roads. Several surveys were rejected by the federal government so that some settlers found their buildings and improvements on adjoining land. Blythe had established a corral and butchering scaffold at Willow Springs in the canyon north of the Trinidad siding. Here he prepared meat for the railroad builders. It was at this spring that the railroad built a watering tank to supply the trains steam engines and settlers were allowed to fill their water barrels. A post office was established at the Trinidad siding by E F Benson, a partner with Willard H Babcock in the B & B ranch, June 20, 1899. Babcock and Benson were raising sheep at Trinidad Bar which they pastured in the mountains across the river during the summer. Babcock had purchased railroad land on either side of the river during the 1890’s. A section crew and depot were located at the Trinidad siding. Carloads of wool were shipped from here. Lord Blythe became the first postmaster at Ephrata in 1900. Here wheat was being hauled from the Waterville country for shipment on the Great Northern. Fifty-one wagons at a time were reported waiting to unload sacks of wheat. One half of a boxcar was used as a depot and the town of Ephrata was platted 7-10-1901, known as Beasley Springs or Two Springs up to this time. In earlier days it had been a stopping place for traveling Indians as well as headquarters for horse roundups for there was water available in the draw west of the town site. When homesteaders encroached on the open range so that cattle raising was no longer profitable, Lord Blythe sold his holdings to Tom and Geo Drumheller of Walla Walla and gave up the Ephrata post office to move to the Methow area. Winchester had a section crew and a telegraph office in another half of a boxcar. A post office was not granted until April, 1903. A Ritzville Times Quincy item of November 1902: “Mrs. Jennie Burr has located on a homestead west of Ephrata near the Winchester siding.” (Years later her daughter Nellie Burr Ring remembered her mother tending the clacking telegraph keys at the first Winchester depot. Nellie Ring operated a grocery store at Winchester until a few years ago). From the "Big Bend Chief," Wilson Creek, WA. I'm still looking for the circumstances that brought this up. The 1905 wheat harvest was a big success and a great surprise to the grain buyers and the railroad, which were not prepared for it. Robert Pope reported thirty-two bushels per acre. Wheat piled up everywhere for rail cars were not available and there was not enough warehouse space. The price to the farmer was 56 cents per bushel. (It was 37 cents in 1901, 50 cents in 1902 and 69 cents in 1903. “Farmers! Please don’t haul in any more wheat for awhile”. Over 110,000 bushels was the estimate received at Quincy and this was not all, for Wenatchee Milling Co had a loading platform and was buying wheat at Crater as well as at the Trinidad warehouse. The Big Bend Chief tells an interesting tale of the discovery of the Great Northern route down Crab Creek by the Urquhart Brothers, the well known stockmen. President James J. Hill had surveyors out trying to locate an eligible route down to the Columbia river, but the grades were all steep. The Urquhart Brothers, who were watching with decided interest the movements of the company, became acquainted with the difficulty experienced by Mr. Hill. Mr. Donald Urquhart, therefore, wrote the Napoleonic railroader a personal letter agreeing to find him a route devoid of "toboggan slides." At first nothing was heard from Mr. Hill, but one evening, some weeks later, a party drove up to Mr. Urquhart's home and desired to remain over night. The following morning they stated that their errand was to find the route of which Mr. Urquhart had written to Mr. Hill. Accordingly Donald hitched up a team and after a month or two spent in running surveys proved the correctness of his statement made in the letter. The engineer, who made the survey met the party at Rock Island and could hardly believe the evidence of the field notes. More especially was he hard to convince as he had made several investments along the northern route for himself and friends with almost a certainty that the road would be constructed along that survey. The only error made by Mr. Urquhart was at Trinidad, where the loop is not made to avoid crossing the canyon at that point. He still maintains that the canyon can be bridged with safety. Within a year from the time that the letter was written to Mr. Hill the whistle of the locomotive might have been heard in the Crab creek valley. "In 1887 a Mr. Jamieson made a survey and located a line for the building of the Central Washington railroad from Cheney, in Spokane county, to a point a few miles west of Coulee City, in Douglas county, Washington, a distance of one hundred and seventeen and thirty-seven-one-hundredths miles. The construction of the Central Washington railroad was begun at Cheney on July 10, 1888, and completed to Coulee City in 1890. The road is completed one mile and forty feet beyond Coulee City, and grade built for about eight miles beyond the end of track, or nearly to the top of Grand Coulee, on the west side. "Starting at Cheney the road, as built, follows the Jamieson survey to a point about two miles west of Medical Lake, a distance of about twelve miles west of Cheney. At this point the road, as built, leaves the Jamieson survey and runs almost due north for about two miles, following down the stream known as Deep Creek for about three miles, crossing the stream on a 44-span trestle bridge, 703 feet long and 40 feet high, built on an eight-degree curve. The road then runs west about one mile, then north two miles, thence southwesterly, thence northwesterly and westerly to a point of intersection, west of Reardan, with the Jamieson survey, being a distance of eighteen miles from where the constructed line left the Jamieson survey, to a point of intersecting it again. 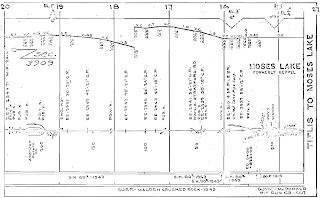 This change necessitated the making of sharp curves, deep cuts, high trestles, sags, and increase of grades and lengthened the road about four and four-tenths miles in the eighteen miles, whereas the Jamieson survey from section 1, township 24, west, range 40 east, ran nearly on a tangent in a west-northwesterly direction, all the way to where the constructed line intersects west of Reardan, making scarcely any cuts, a much easier grade and distance shorter four and four-tenths to where the road is now built. "At a point about one mile west of Davenport the road, as built, turns south and southwest, thence west to Rocklyn, then northwest to Creston, a distance of about twenty-two miles. Some ten miles of this distance the road, as built, passes through a belt of scab land, composed of basaltic rock, necessitating numerous rock cuts, making this ten miles the most expensive piece of road to build between Cheney and Coulee City. The Jamieson survey, in covering this distance, runs west-northwest from Davenport until nearing the scab land, that road, as built, passes through, when it runs south avoiding the scab land and rock, crossing back to where the road is now built between Wilbur and Govan, making a much shorter route. The advantage of the Jamieson survey over that of road as built for above distance was a saving in distance, grades, curves, and avoiding the rock cuts. At about the 86th mile post, near Almira, the road a built again leaves the Jamieson survey, runs northwest for about tow and one-half miles and thence southwesterly for about fourteen and one-half miles, intersecting the Jamieson survey again at about mile post 104. "On the Jamieson survey the grade is descending the whole distance, while on the road as built is rises to an elevation of 2,108 feet, three and one-half miles west of mile post 86, making this difference; the Jamieson survey, length, 16 miles; road as built, length, 18 miles; Jamieson survey, grades not exceeding .7 per cent; road as built, six miles, .8 to 1.5 per cent; twelve miles, .4 to .8 per cent grades. About the only explanation that is given for this change of the construction of the road is that about the time of the beginning of the construction of the Central Washington railroad there was a townsite company formed and composed almost entirely of the Northern Pacific officials, who were either in charge of the construction of the Central Washington railway, or occupying positions that gave them prominence in controlling and directing the affairs of the Northern Pacific Railway Company. It is a matter of regret to both the owners and to the patrons of the Central Washington railway that this townsite company could not have secured as favorable terms for their purpose along the line of the Jamieson survey as where the road was built." Numbers across the top are mileposts. The broken line below that is the grade profile. EE numbers are bridge numbers. Also shown are public and private crossings, plus you can see where Stratford Road crosses the line. Unfortunately, reproduction of the yard tracks in Moses Lake proper was very poor. Below that is the weight of the rail and when it was rolled, with the bottom line showing where the ballast was from and what year it was placed. Early in January 1890, Lincoln county, in common with all of eastern Washington, was visited by perhaps the worst snow storm in its history. For more than a week the settlers of the county were without communication with the outside world. Railroads were blockaded and many passengers on the various trains were snowbound in different towns. The drifting snow blockaded the railroads as effectually as though a deluge had obliterated the tracks and it was only by persistent labor that the wheels were again set in motion. The wind began blowing January 1st, and whirled the light snow across the country. Every cut, no matter how deep, was piled level full, placing an impregnable face to the locomotive. Trains on the Central Washington and Seattle, Lake Shore & Eastern roads arrived in Davenport from Spokane Falls Wednesday night, January 1, and from that time until the 6th no train was able to make its way through. January 3d the powerful snow plow of the Central Washington left Davenport, urged on by three engines, and a passenger train followed in its wake. At Reardan the monster plow plunged into a cut and there stuck fast. Two other engines were almost pulled to pieces and considerably damaged in an endeavor to extricate, or force on the plow. This condition of affairs continued until Sunday, the 5th, when a rotary snow plow began work out of Cheney. This monster cork-screw worked a clearing until it reached a point a few miles east of Reardan, when it, too, was disabled and taken back for repairs. Returning on Monday it had a track open and traffic was resumed east of Davenport. The western end of the route was then attacked and opened in the course of a few days. The rival road, Seattle, Lake Shore & Eastern was not so successful in opening its track, having no snow-plow, and spring had opened before it was in running order. The town of Wilbur was cut off from all outside communication for 31 days. First Big Bend Railroad "Merger"
"'The Northern Pacific Company has purchased a little more than a majority of the capital stock of the Seattle, Lake Shore & Eastern--that is, about $3,000,000 out of $5,000,000--and has leased the remainder of the property upon the basis of six and three-quarter per cent interest on the outstanding bonds and the further issue of bonds to complete the line to the International Boundary, a total of about $5,000,000. The annual rental will be about $8,000,000, but inasmuch as the Seattle Company has thus far earned its interest, the Northern Pacific is not likely to be called upon to make good any deficit. The Northern Pacific will enter up on the operation of the Seattle road on the 25th of July.'" This virtual consolidation of the two lines was particularly unsatisfactory to both Davenport and Spokane. The former town had expended several thousand dollars for the purpose of securing a competing line into the Big Bend Country, while Spokane had subscribed $175,000 in stock to the Seattle, Lake Shore & Eastern road. A serious wreck occurred on the Central Washington railroad, six miles west of Wilbur, Wednesday morning, January 8, 1890. The road had been blocked with snow for a long time and the first train out consisted of engines Nos. 100 and 447, one box car and two way cars. This train left Wilbur about 10:30 o'clock a.m., for Almira, to clear the track. West of town a cut of eight feet deep was encountered, full of solidly drifted snow. The two engines made a run for the cut, but the hard condition of the drifted snow caused both locomotives to jump the track. The engines rolled over and fatally injured the engineer and fireman of 447, Messrs. Melcher and Burroughs. Tim Raridon, the old-time conductor, who was on the head engine, jumped through the cab window before the engine fell over, escaping with a severe shaking up and a few bruises. Engineer F. Gorman, of No. 100, and his fireman, McClellan, had a very close call, but escaped with a slight scalding. "Engineer Melcher was the most severely injured and died in a few days. His injuries were internal, caused by begin jammed in the debris, and also from inhaling steam. His fireman, James Burroughs, suffered terribly, being held against the boiler-head among the burning coals which had been thrown from the fire-box, and the escaping steam from the busted pipes. Help was immediately summoned from Wilbur and all that was possible was done to relieve the sufferers. The cut where this accident occurred is about 150 feet long and the head engine, 447, had not advanced within more than 75 feet before it left the rails, running on the ties about fifty feet more, when the pilot appears to have struck some obstacle, doubled up, or buckled, torn off the front trucks and shot the engine over on the right side at right angles to, and almost clear, of the track. The second engine was keeled over on its left side and embedded in the side of the cut." Box Car Wheels Pass Over Body, Causing Death. One of the saddest accidents that it has been our duty to chronicle in many a day, happened in this city last Saturday. Arthur Osborne, ten-year old son of Mr. and Mrs. Chas. Osborne, in company with a son of Cash Bartholomew, was playing over near the Standard Oil plant. The Waterville train with A.N. Moreland engineer, and J.M.G. Wilson acting as brakeman, were backing the train onto the Standard Oil track to spot an oil car. There was a box car, an oil tank car and the engine in the train. Mr. Wilson was on top of the box car and the boys had climbed on this car and appeared on top. He told them to sit down and wait until the train stopped and then get off. He went down on the side of the car next to the oil plant to signal Mr. Moreland where to stop. The boys then went to the end of the car, which was moving slowly, and climbed down. Arthur went down the ladder on the end of the car. It is quite a distance from the last round of the ladder to the ground and when he made this step he fell across the rail. The wheels of the car passed over his right leg close to the hip joint and his left hand. W.P. Hendricks, who is employed by the Standard Oil Company, was standing back at the end of the track when he saw the boy fall. He rushed down to the train shouting for them to stop, and ran around into the office to phone for a doctor. Fred Bullard had just driven up in his car to get some oil and J.M.G. Wilson put Arthur in this car and they rushed him to the hospital. Dr. Ellis and Dr. Adams were both there in a few minutes and worked hard to save the boy’s life. His leg was taken off close to the hip and three fingers on his left hand were also taken off. It seems when the train went over him he was dragged for twenty-five or thirty feet, and his left leg was also broken. The little fellow seemed to rally for a time after coming out from the anesthetic and then grew worse, passing on shortly after seven o’clock that evening. This is the first accident that has happened on the Waterville Railway, where there was a loss of life. The sudden shock to the community and the sadness of the accident caused a great outpouring of sympathy to the bereaved father and mother. Arthur William Osborne was born at Seattle, Washington, July 25, 1913, and died September 22, 1923, at the age of 10 years, one month and 28 days. He was three years old when his parents moved to Waterville. He leaves besides his parents, one brother eight years old and a sister three years old. The funeral was held from the Presbyterian church Monday afternoon at two o’clock, conducted by Rev. C.J. Boppell, and was attended by a large concourse of sorrowing friends. The floral offerings were many and very beautiful. Mr. and Mrs. William Read, father and mother of Mrs. Osborne, and her brothers, Tom, John and Roy Read, all of Wenatchee, and her sister, Mrs. McCardell, of Spokane, were here for the funeral. Internment was made in the mausoleum. There has been every effort possible put forth by friends and neighbors to extend sympathy, and to do all that human hands can do to aid the bereaved parents and to relieve, as far as possible, the sorrow, by kindness.